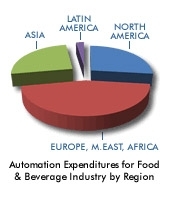 Automation expenditure in the food and beverage industry is expected to reach $6billion by 2013, according to a new study from ARC. John Blanchard, principal analyst for the CPG (consumer packaged goods) industries and the principal author of ARC's 'Automation Expenditures for Food and Beverage Industry Worldwide Outlook,' comments: "The information architecture is extending its reach all the way to the consumer by way of social networks and a new generation of truly virtual on-line shopping and on-line product customisation tools. It is becoming an important solution in the drive toward mass-customisation and has begun to change the way consumer-facing business is conducted." The three major areas of focus in food and beverage manufacturing are cost management and margin protection, more sustainable manufacturing focused on energy usage and waste reduction, and better ensuring food safety. Survival is also dependent upon product, packaging, and manufacturing innovation. Since most CPG companies have similar business strategies, flawless and timely execution differentiates leading companies from their competitors. This study will help users learn what others in the industry are doing and the capabilities of each supplier. It discusses strategies and tactics for suppliers and user manufacturers to be successful in the rapidly changing environment of the worldwide food and beverage industry. * How do I address the fluctuating price and availability of commodities? * How do I reduce my energy and other utilities costs and ensure the long-term availability of these resources? * How do I find and evaluate new technology that will support innovation and speed time-to-market? * How do I reduce my manufacturing cycle time? * How do I come up with new ideas or equipment that allow multi-tasking and that can reduce changeover time? * What are the best metrics to support future manufacturing requirements? * What are the leading best practices in the industry? * What is my competition doing? * How do I support my ever expanding manufacturing and business automation systems and networks? * What are other companies doing to improve the skill sets of their operators and staffs?